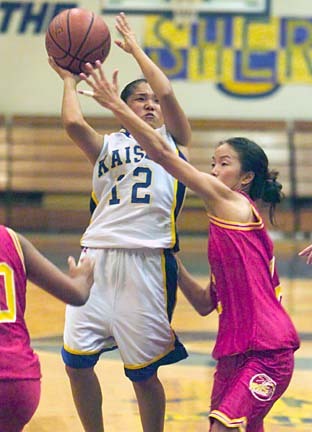 Kaiser's Shera Yamamoto went to the hoop against Roosevelt Rough Rider Chelsie Kadota during last night's game. For Kaiser coach Lisa Mann, the best thing about "Senior Night" yesterday is that she loses only one at the end of this season -- point guard Shera Yamamoto. "She's a big loss, though," said Mann, whose team is made up of eight juniors and a sophomore in addition to Yamamoto. "She's made a huge difference for us." Yamamoto hardly disappointed in her final home game, adding a pair of 3-pointers to help lift the Cougars over Roosevelt 46-41 in the regular-season finale for both teams in Hawaii Kai. "We had to play to win tonight," said Yamamoto, who started her 82nd consecutive game for Kaiser last night, including preseason and playoff contests. "There was pressure, but I had to put it past me since this was my last game here." Roosevelt (7-4) played with a sense of urgency of its own last night. A Division II program under the Oahu Interscholastic Association's new postseason format, the Rough Riders could have gained entry into the Division I tourney with a win. Instead, Roosevelt will participate in the D-II tourney. "It gave us some incentive," said Roosevelt coach Bobby Keanini, whose team dropped its last two games after an upset win over East champion Kahuku last week. "I like competing at the Division I level, but we're where we're at because we didn't do it (on the court). But it hurts not having that fifth and sixth seed from the East." Kaiser finished 9-2 -- its best mark in Mann's seven seasons as coach -- to earn the East's No. 3 seed. As has been the case all season, the Cougars used solid inside play from Sharde Pratt (10 points, 10 rebounds) and Kilioe Aliifua (11), and timely plays by Yamamoto (6) and back-court mate Jaime Nerona, who made good on eight of 10 free throws in the last 47 seconds and finished with 13 points. "In the first half, we seemed to miss most of our free throws; in the second half, we didn't miss many," Mann said. "The kids played with confidence, although not necessarily with discipline." Kaiser finished the game 21 of 33 from the free-throw line and hit on 13 of 18 in the second half. Conversely, Roosevelt was just 8-for-24 from the charity stripe. Leading 12-11 with 3 minutes remaining in the second quarter, Kaiser finished the half on a 9-2 run for a 21-13 lead at intermission, and moved out to its largest lead of the night (at 30-18) with 3:20 to play in the third. Yamamoto's 3-pointer from the wing to open the fourth quarter (to make it 33-22, Kaiser) helped to keep the visitors at arm's length before Nerona's mastery from the free-throw line helped seal the Rough Riders' fate. Nicole Yoshimoto led Roosevelt with 11 points. ROOSEVELT-- Tati Beasley 7, Chelsie Kadota 3, Dasha Kawakami 0, Larisa Nakasone 3, Nicole Yoshimoto 13, Shannon Miyashiro 11, Nicole Okada 4, Miya Frank 0. KAISER-- Shera Yamamoto 6, Jaime Nerona 13, Chelsea Kapuniai 2, Sharde Pratt 10, Natasha Aloisio 0, Kelsey Beck 0, Kehau Bangay 4, Kilioe Aliifua 11. 3-point goals -- Roosevelt 3 (Yoshimoto 2, Nakasone), Kaiser 3 (Yamamoto 2, Nerona). Shaina Siliga scored 17 points, including five 3-pointers, as the Mustangs overcame eight Falcons 3-pointers for the victory. KALANI-- Richline Batoon 6, Liandra Bonifacio 0, Kim Cabudaya 2, Keri Hee 4, Nicole Isemoto 0, Megan Kamehiro 15, Alisa Lum 11, Tamari Miyashiro 8, Karlie Saiki 0, Kristie Saiki 2, Krista Young 0. KALAHEO--Hoku Kaiu-Denning 0, Shaina Siliga 17, Kandice Kinney 2, Randi Farstad 12, Wesley Whitman 5, Shantel Marumoto 6, Kaila Samson 7, Maila Samson 0, Shanadee Canon 11, Kaliko Kepa 7. 3-point goals -- Kalani 8 (Kamehiro 3, Lum 3, Batoon 2), Kalaheo 7 (Siliga 5, Samson, Canon). Pohai Hovey scored 16 points to help the Surfriders pick up their first non-forfeit win of the season in their last game. Keri Nakahashi led the Bulldogs with 16 points. KAIMUKI-- Kara Hayashida 5, Keri Nakahashi 16, Nicole Sasaki 5, Chelsea Gornichec 2, Noelani Duffey 1, Dena Nakahashi 1, Chasity Laulusa 1. KAILUA-- Kori Maekawa 4, Kalina Kama 11, Ashley Shigaki 12, Hoku Arias 0, Tanisha Milca 7, Keala Iaea 4, Pomai Fernandez 2, Pohai Hovey 16, Zoe Morgain 0. 3-point goals -- Kaimuki 6 (K. Nakahashi 5, Hayashida), Kailua 5 (Shigaki 3, Kama 2). Kayla Kam scored all 12 of her points in the first half as the Hurricanes took a 24-13 halftime lead and held on to beat Campbell. Chaunte Jackson scored 23 to lead the Sabers. CAMPBELL-- Joanne Corpuz 4, Nicole Jackson 0, Latara Tano 0, Shiann Leong 0, Tiani Sojot 0, Jenna Contemplo 0, Raynette Whitfield 8, Terri Feagiai 4, Chaunte Jackson 23. KAPOLEI--Tasha Faumuina 4, Raelynn Reyes 0, Kamaile Kelekolio 0, Tanya Menino 7, Nicole Tamapua 0, Shauntay Leutu 1, Kayla Kam 12, Gabrielle Tabios 0, Jerrell Taituave 12, Shanna Arthur 8, Pamela Mellinger 2, Leafa Vagatai 4. 3-point goals -- Campbell 3 (Jackson 3), Kapolei 5 (Arthur 2, Kam 2, Menino). Renee Busch and Laura Florendo each scored 10 points as the Marauders snapped a seven-game losing streak by beating Aiea. AIEA-- Kim Elia 2, Shareyn Muneoka 0, Shannon Nahoopii 0, Tiffany Pearson 6, Sherylann Miyashiro 2, Michelle Shiroma 0, Cheri Gauer 0, Felisha Liilii 0, Zori Drew 7, Jamie Rosario 3. WAIPAHU-- Renee Busch 10, Tiffany Caliboso 2, Nicole Enos 2, Laura Florendo 10, Tiare Kaulupali 1, Joanne Manuel 4, Ashley Mendoza 7, Malia Spencer 4, Juliana Sooalo 2, Elsha Tivera 0. 3-point goals -- Aiea 0, Waipahu 1 (Mendoza). Led by game-high scorer Kamill Riego de Dios, the Chargers went on an 8-0 run at the start of the second quarter as they rolled over the Seariders. PEARL CITY-- Lenny Radona 4, Miki Uyeshiro 0, Kellie Nishikida 0, Kristylen Among 8, Desiree Blaney 6, Kamill Riego de Dios 12, Mele Laulea 5, Marci Lobendahn 10, Lusia Kleinschmidt 3. WAIANAE-- Aliah Irvine 0, Daina Correa 3, Chelsie Park 5, Naomi Lino 7, Charisse Estrera 0, Wendy Peltier 4, Tihare DeMello 3, Audrey Hauge 5, Tiare Kealoha-Holbron 3, Naomi Endo 0. 3-point goals -- Pearl City 4 (Riego De Dios 4), Waianae 4 (Correa, Park, Hauge, Kealoha-Holbron). Leading scorers--UHS: Desiree Memea 13, Kylie Lum 11, Iwalani Yamaguchi 10. Iol: Julie Watanabe 14.